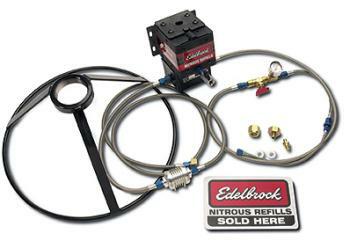 Edelbrock Nitrous Pump Station UNIVERSAL - Dezod Motorsports Inc - Home of the automotive performance enthusiast since 2002. The Refill Pump Station comes complete with all the plumbing, hoses, gauge, valve, fittings and bottle stand necessary to transfer nitrous from a mother cylinder to the receiving bottle. It runs off compressed air and requires no electrical hook-up. Includes dealer decal and banner. The combination water separator and air pressure regulator is designed to be used as an accessory with our nitrous refill pump station. Besides regulating the air pressure to the correct level, it prevents water from entering the nitrous pump and causing damage, thereby extending the life of your transfer pump. If time and use has gotten the best of your Edelbrock Nitrous Pump then you will want to consider the Edelbrock Replacement Pump for your Edelbrock Nitrous Pump Station. This is the pump alone with no adapters, fittings or lines – just a bolt on replacement for Edelbrock Part # 78000.